A cardiopulmonary bypass machine (CBM) is commonly known as a heart-lung bypass machine. It is a device that does the work of providing blood (and oxygen) to the body when the heart is stopped for a surgical procedure. In most cases, the machine is used to perform serious procedures that require the heart to be stopped. Patients are on the pump only as long as it takes to stop the heart from beating, complete open heart surgery or a procedure on the lungs, and restart the heart. Why Is Cardiopulmonary Bypass Used? To stop the heart without harming the patient, oxygenated blood must continue to circulate through the body during surgery without stopping. The cardiopulmonary bypass pump does the work of the heart, pumping blood through the body, and making sure that the tissues of the body get the oxygen they need. The machine also adds oxygen to the blood while taking over the pumping action of the heart, replacing the function of the lungs. The CBM is used for two primary reasons. The most common reason is so the heart can be stopped for surgery. Some cardiac surgeries would be impossible to perform with the heart beating, as surgery would be performed on a “moving target” or there would be significant blood loss. A great example of this is a heart transplant procedure – the patient's heart must be removed from the body so the donated heart can be put in. Without a pump to replace the action of the heart, the heart transplant would be impossible. The same is true of some lung surgeries, there must be a way to oxygenate the blood when the lungs cannot. A lung transplant procedure requires an alternative way to oxygenate blood when the lungs cannot, but the heart may continue to beat during the procedure. For other patients, the pump is used not for surgery, but to help keep a patient alive when they are experiencing heart failure that would be life ending. In some rare cases, a heart failure patient may be placed on the pump to support the patient until a heart transplant becomes available. How Does Cardiopulmonary Bypass Work? 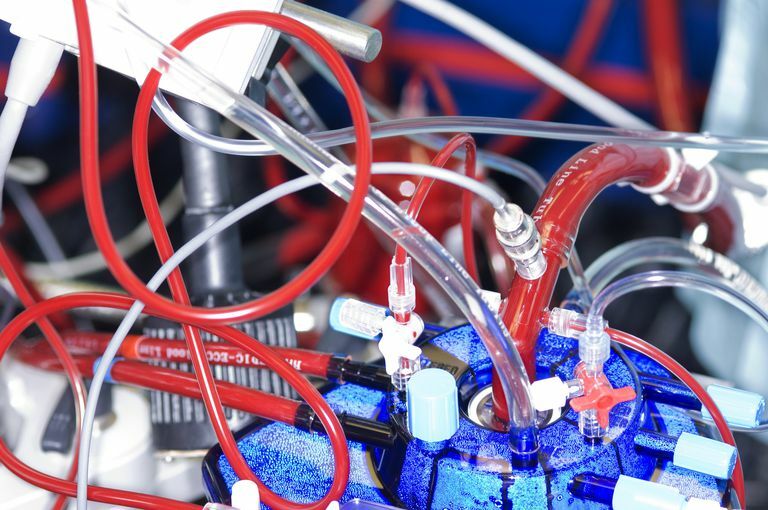 The surgeon attaches special tubing to a large blood vessel (like starting a very large IV) that allows oxygen-depleted blood to leave the body and travel to the bypass machine. There, the machine oxygenates the blood and returns it to the body through a second set of tubing, also attached to the body. The constant pumping of the machine pushes the oxygenated blood through the body, much like the heart does. The placement of the tubes is determined by the preference of the surgeon. The tubes must be placed away from the surgical site so they do not interfere with the surgeon’s work, but placed in a blood vessel large enough to accommodate the tubing and the pressure of the pump. The two tubes ensure that blood leaves the body before reaching the heart and returns to the body after the heart, giving the surgeon a still and mostly bloodless area to work. A third tube is also inserted very near or directly into the heart, but not connected to the CPM. It is used to flush the heart with cardioplegia, a potassium solution which stops the heart. Once the cardioplegia takes effect, the CBM is initiated and takes over the heart and lung function. Who Runs the Cardiopulmonary Bypass Machine? The person who runs a cardiopulmonary bypass pump is called a perfusionist. Perfusionists typically have a bachelor’s degree in a health-related field, then pursue an additional two years of education training as a perfusionist. Some perfusionists take an exam to become a certified clinical perfusionist, which is similar to a physician being board certified in a specialty. The risks of being on heart and lung bypass include blood clots, bleeding after surgery, surgical injury to the phrenic nerve, acute kidney injury, and decreased lung and/or heart function. These risks are decreased with shorter times on the pump and increased with longer pump times. When possible, it is important to take the time to discuss the risks and rewards of the procedure as well as alternatives to surgery before you make a decision. Cardiopulmonary Bypass. Cincinnati Children’s Hospital. Risk Factors for Pulmonary Complications Following Cardiac Surgery With Cardiopulmonary Bypass. International Journal of Medical Sciences. What to Expect During Heart Surgery. National Heart, Lung and Blood Institute. What Is a Cardiovascular Perfusionist? Perfusion.com.